I knew it all along that nature plays a huge part in my diet. You see, just the mere sight of a flock of birds heading south and the presence of dark gray puffy clouds, sent my palate on overdrive. So, I went for my trek around my neighborhood to keep my dear mind and body in physical and mental shape for the day. As the beads of sweat made their way down my brow, (yes, today, humidity is high and temperatures are heading to the eighties), my mind was on the culinary side of things. Without a doubt, precipitation was on the way. As soon as I returned to my small kitchenette, I knew what I had to do. 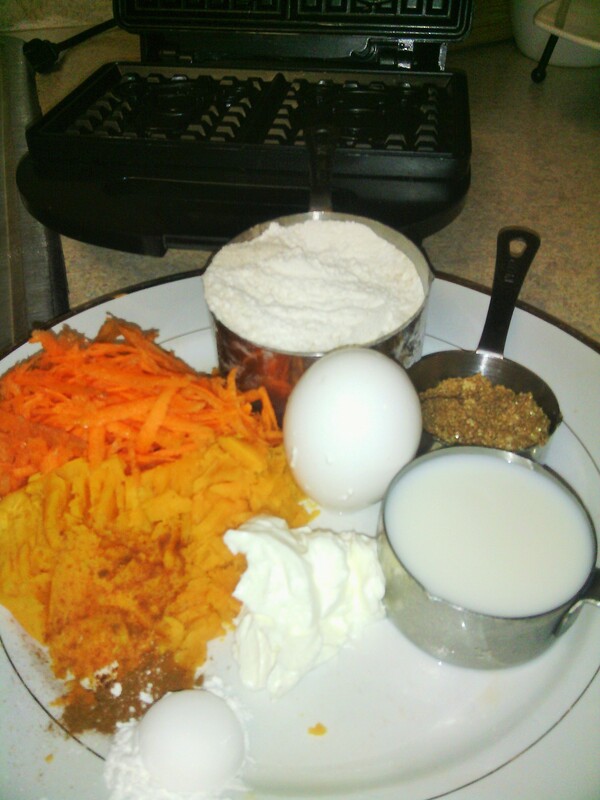 So, gathered the following for some comforting carrot and sweet potato waffles. A wee bit out of ‘whack’, but, I thought the combination would be awesome. And, bingo! I was right. Sweet potato was cooked in microwaved for approximately 3 minutes. Every microwave is different. Then potato was mashed and set aside to cool. Wet ingredients were combined and dried ingredients were added. Then, carrots and smashed potato were added to batter. Pam spray was added to waffle iron before batter was placed on iron. Each waffle iron is different. After light went off on mine in about 5 minutes, waffle batch was cooked; crispy on the outside and perfectly cooked on the inside. As I watched the trees meandered to the blustery breeze on the outskirts, I cut into my delicious and warm waffles. I served these with fresh strawberries and a squeeze of light pancake syrup. Guys, I was in heaven!